Stockport County’s tenures with adidas tend to throw up national shirt-related oddities. In 1981-82, the club were wearing Argentina-inspired light blue and white stripes, but the outbreak of the Falklands War meant a hasty change. Fourteen years later, they would wear another nation’s shirts, albeit in less controversial fashion. 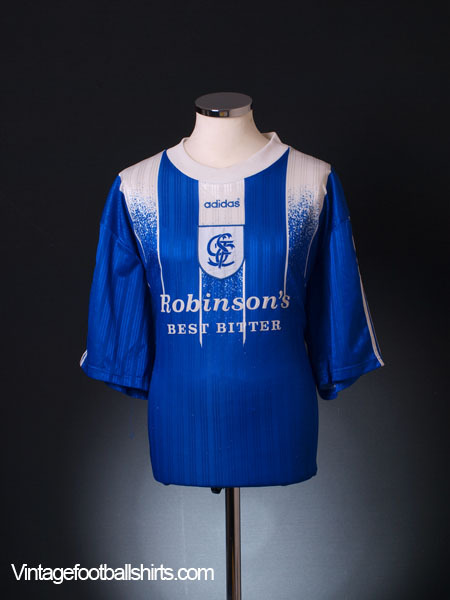 Having switched from adidas to Bukta in 1984, Stockport returned to the three stripes in the summer of 1996, with a new blue home strip and a white/black change kit. However, in the Coca-Cola Cup, The Hatters were drawn away to Blackburn Rovers, meaning that a third shirt would be needed. They contacted adidas, who provided them with yellow shirts featuring red-trimmed blue stripes over the shoulders, worn with the blue home alternative shorts and the home socks. If the shirt looks familiar, that’s because it was the same as that used by Romania at Euro 96. And we don’t just mean the same design – the fabric featured the Romanian crest repeated throughout. Crystal Palace used the same for their third shirts that season, but we haven’t been able to ascertain fully if the kit they wore featured the Romanian elements. Naturally, these Stockport shirts are ultra-rare. 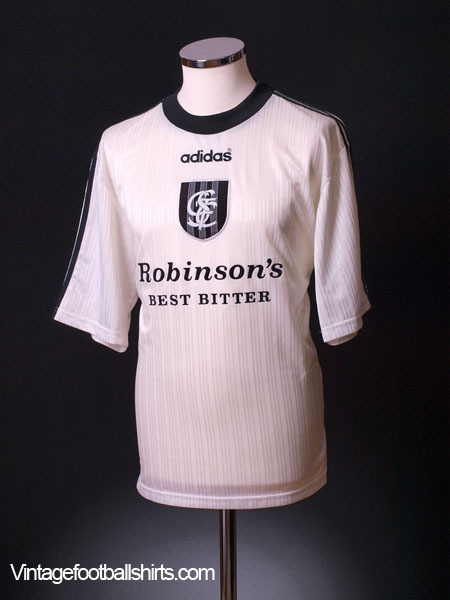 County’s second spell with adidas ended in 1999 but, just maybe, if they link up again, we’ll see a rarity based on another country’s kit. Got another one off for you from Boston United- email me!